I’m just going to come right out and say it: February is not my favorite month to live in northern Michigan. We often talk about the joys of cold weather here and the frolicking and fun of our respective slice of winter wonderland– and I get that, I really do. But this month. This month seems to bring out the wonderlust. This month seems to bring out the cranky fair weather northerner that looks outside and says “ugh. snow. again.” This month– the shortest of the year– seems to drag on and on and on for me. Last year, I celebrated the birth of our third child, Elizabeth. I spent February in the sheer bliss of newborn abyss, and before I knew it, well, spring had sprung…and I found myself waxing poetic about my dust-covered cross country skis. And this year– this gloriously real winterish year– I’ve loved every second of the snowy season. Yet I still found myself perched against the couch today in that familiar February funk. …As in googling “cheap flights” and momentairly imagining throwing my children onto an airplane and not getting off until we were somewhere warm and “all inclusive.” **Note– this shows the depth of my stir-craziness– I have not, nor likely ever will, embark on a vacation that includes that phrase. Because there is something fantastic about watching your child build a person. Even if it is a snow person. 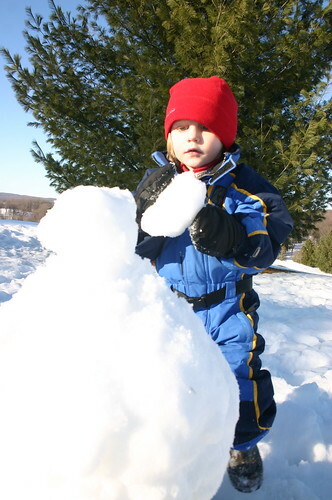 And because you can forget you aren’t a child and start shaping that little man too (especially when your kid becomes far more interested in eating snow than making anything). 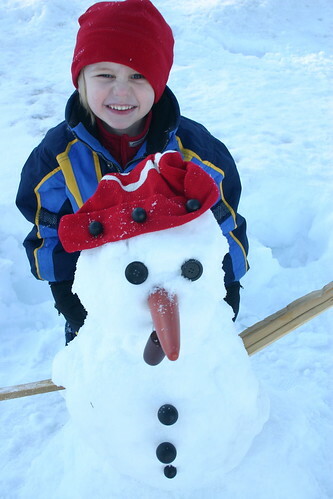 A set task like a snowman forces you to slow down. 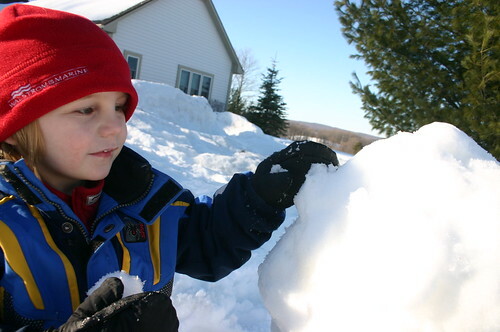 To watch little hands carefully packing and patting and sweeping at the snow. To notice how the cold blue sky seems so far away, and yet, so tied to your little boy’s eyes. Yup. A Henry. We definitely made a Henry, who, as good luck should have it, happened to be the second cousin of Henry the talking gnome that lives in our garden and also in Max’s toy box. 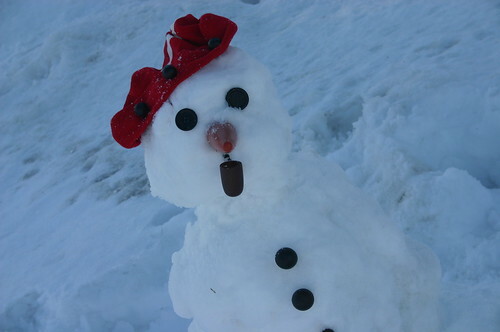 The best thing about a snowman? Just look at the face of the kiddo beside him. nothing wrong with snow! what a great thing to do with your son, it looks as if he enjoyed every second of creating henry. get out and ski, that should be some good winter therapy for to get you through the next month and a half. as always, nice to read your wonderful words, they bring a smile to my face. what a wonderful thing to do with your son. He and Henry seem to be enjoying a day in the sun! Winter can be hard but making these extra efforts to make the most of it will pass the time and before you know it your garden will be blooming! Another great posting. Great pics … good family adventure; a good way to stave off the winter blues … thanks for sharing. Growing up in a much warmer climate, I sometimes wonder how people make it through snowy winters without losing it. I’ll look forward to finding out this week. You are made from heartier stock than I am. 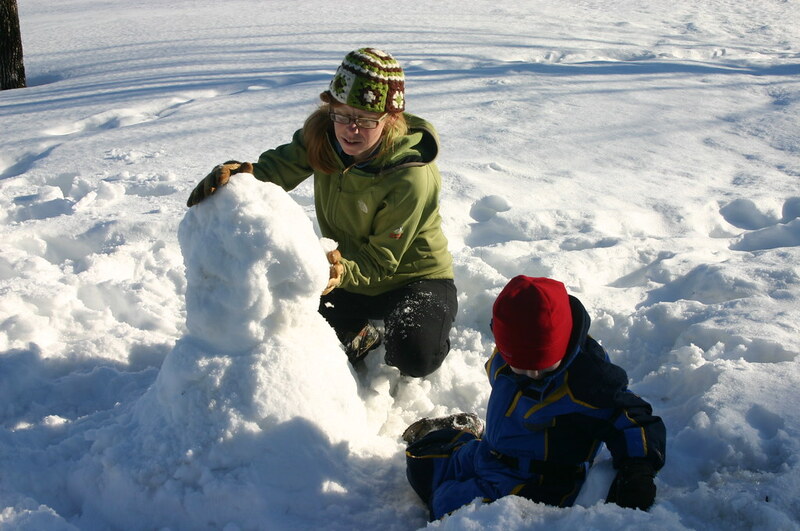 We built snowkids last week in our front yard, and you are right: it is magical. Not to mention the hot chocolate that follows, and the nice dry warm socks that await your return. i understand the February blues. I grew up in Michigan and that “short” month is such a “long” month. Love the fact that you are out with your darling child and building some great memories. Soon you will be walking the shores of beautiful Northern Michigan on 70 degree days. That’s it! dive in ’cause there’s no outswimming it!